Recipe Copyright © 1997 Kasma Loha-unchit. Start a batch of mesquite charcoal in a barbecue kettle and soak the wood chips. 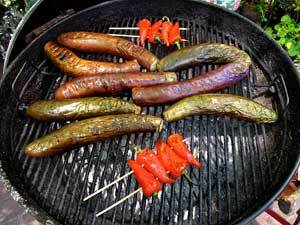 While waiting for the coals, trim the tops off the eggplants and the peppers. Make a hot-and-sour sauce by mixing together the chopped Thai chillies, lime juice, fish sauce and sugar. Let sit for the flavors to blend and mingle. Prepare the remaining ingredients. Blanch shrimp in boiling water for 30 seconds to cook. Drain well and set aside. Grill the eggplants and peppers whole over the hot mesquite, turning occasionally until they are slightly charred on the outside and have softened. For a stronger smoked flavor, add damp wood chips to the red coals and cover the barbecue kettle after each turning. Place the grilled eggplants and peppers in a paper sack for a few minutes to steam. When cool enough to handle, peel off the charred skin and thin outer membrane. Cut each eggplant crosswise into segments about 1 1/2 inches long, each segment in half lengthwise, and each half in 2-3 strips, depending on the size of the eggplant. 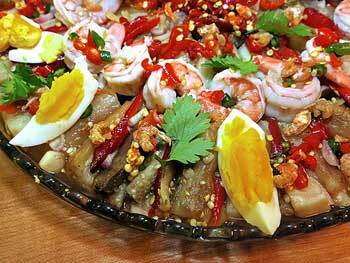 Arrange on a serving platter and spread the sliced shallots over the top. Cut the skinned peppers into long, thin strips. Do not remove the seeds if you want an extra spicy salad. Arrange in an attractive design over the eggplants and shallots and top with the cooked shrimp. Taste and adjust the spicy lime sauce so that it is equally sour and salty with a hint of sweetness. Spoon evenly over the salad. Garnish with egg wedges and cilantro. Serve at room temperature. Serves 6-8. One of my vivid memories from childhood is helping Mother skewer and sizzle large green chillies over hot coals. These were followed by succulent eggplants, roasted and charred to perfection. Both were then skinned, cut up into bite-size strips, arranged beautifully on a serving plate and dressed with a limy hot sauce. As you fire up your barbecue kettle or hibachi on hot days this summer, grill up some eggplants and chillies along with your chicken and meat for a spicy, lip-smacking dinner. Kasma teaches this recipe in the Evening Series Advanced Set A-1. Recipe Copyright © 1997 Kasma Loha-unchit. All rights reserved.